Wynnewood, PA – Governor Tom Wolf was joined by Auditor General Eugene DePasquale at Penn Wynne Elementary School in Montgomery County today to announce the creation of a School Safety Task Force that brings together government officials, statewide education organizations, law enforcement, community members, school officials, teachers, parents, and students to talk to about ways to improve school safety and security. Governor Wolf and Auditor General DePasquale will co-chair the task force along with vice chairs Charles Ramsey, chairman of the Pennsylvania Commission on Crime and Delinquency; Mark DiRocco, Executive Director of the Pennsylvania Association of School Administrators; Judy Morgitan, Immediate Past President of the Pennsylvania Association of School Nurses and Practitioners; and Bonita Allen, President of the Pennsylvania Parent Teacher Association. The Wolf Administration and state partners will support the work of the task force including Education Secretary Pedro Rivera, Acting Health Secretary and Physician General Dr. Rachel Levine, Labor and Industry Secretary Jerry Oleksiak, and Lt. Colonel Robert Evanchick, Deputy Commissioner of Operations, Pennsylvania State Police. The task force will hold regional meetings throughout Pennsylvania over the next few months to hear the perspectives and needs of different communities. 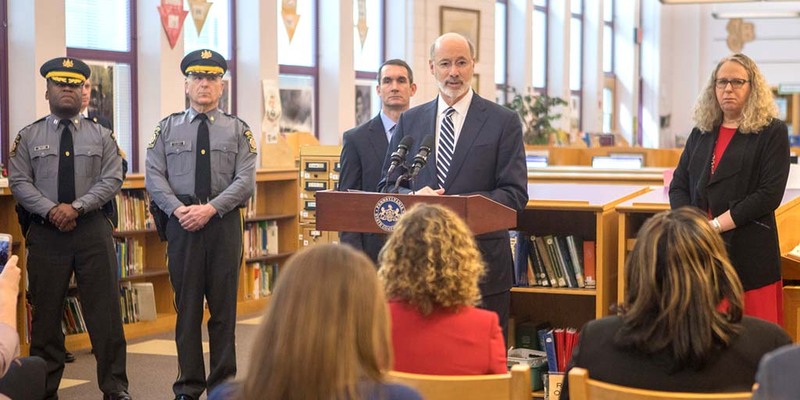 As part of the governor’s effort to hear from Pennsylvanians on school safety, he is inviting the public to share their perspective and suggestions by providing feedback online at https://www.governor.pa.gov/school-safety-feedback/. The submissions will assist the task force in preparing a final report to the governor.